Born into a highly cultured, working-class family, Ceri Richards and his siblings were all taught to play the piano. The exposure to the arts, particularly to music, built a inclination towards what would be a major source of inspiration and stimulus to Richards’ painting. Throughout many periods of his life, Richards returned to the theme of music. In his early pictures, the music room and the piano are the focus of the artworks. However, in his latter works, the images become less representational, with light and color becoming important elements of the works. 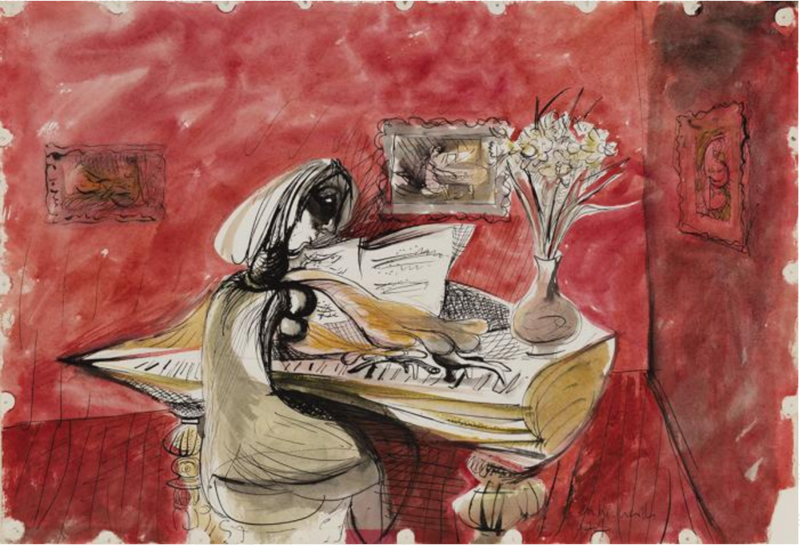 The whiteness of the woman and piano in the picture that contrast the bright red room that forms the background not only distinct the piano and the room from one another, but also shines the spotlight on the two.